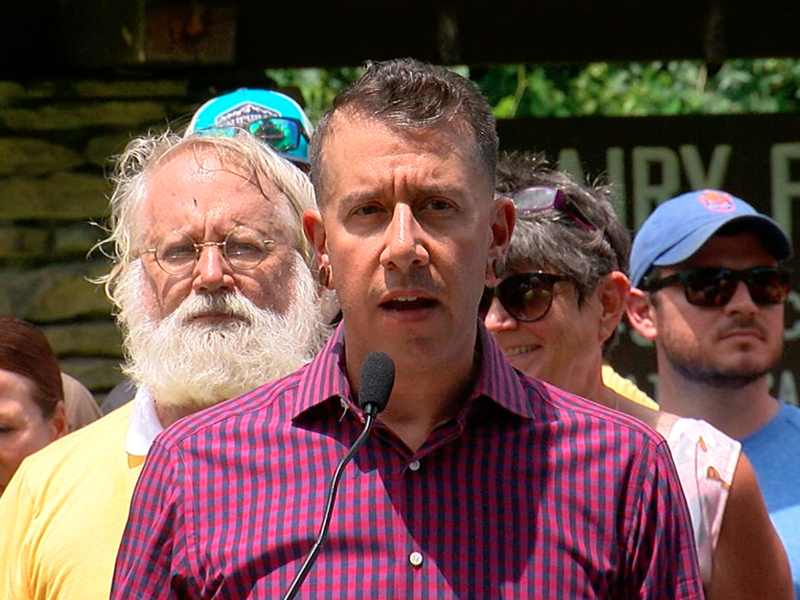 CINCINNATI -- Mountain bikers and trail advocates from across the region braved Tuesday's sweltering heat to see a vision 20 years in the making finally become reality. During a ceremony in front of advocates and reporters, city leaders and the mountain bike community broke ground on what will become a 4.5-mile natural-surface trail -- as opposed to a paved path -- winding through a modest pocket of Mount Airy Forest. Beyond serving as a new outdoor attraction for the city's resurgent urban core, the sentiment during Tuesday's groundbreaking was that the long and winding nature of the trail to come also symbolizes the journey organizers had to take to get to this point. "This day is very long-coming for the city and the mountain bike community," said Doug McClintock, who heads up the Cincinnati Off-Road Alliance, a regional nonprofit that has worked to build and maintain natural surface trails throughout Greater Cincinnati and Northern Kentucky. "Even though I'm standing here representing that community today, I’m standing on the shoulders of countless volunteers from the past twenty years," he told reporters during Tuesday's groundbreaking. Like any trail through the woods, though, this project met its fair share of obstacles and hazards along the way. One of those challenges, McClintock said, was overcoming some stereotypes that have built up around the mountain biking community over the last several decades. If you've ever seen a Red Bull energy drink advertisement featuring extreme athletes performing death-defying stunts on mountain bikes and dirt bikes, you know the type he means. "(Mountain bikers) have overcome a stigma, which was: These are the people riding bikes, doing jumps and promoting Red Bull, which is not what most mountain bikers are," McClintock told WCPO. "We have people who are professionals, people who are working class, people who come from all different backgrounds who just like riding their bikes." This was a critical message to send decision-makers at City Hall and on the city's Parks Board of Commissioners. "I don't see any people doing jumps over us, which makes a big difference. I think that stigma was important to get past, and that took some time," he said. McClintock's sense here was validated by Mayor John Cranley's remarks during Tuesday's groundbreaking, when he spoke about the city's urban parks as serving all types of people. "Most importantly, our urban parks are for people," Cranley said. "They need to stay natural. They need to stay green, but they’re for people, and we want people to come in to the park and see living near a park as a major asset for choosing the city over a suburb or some other community." A respect for conservation also drew out the process, according to Parks Department Director Wade Walcutt. Walcutt, who began with the city just last year, told WCPO that experts spent countless hours surveying vegetation and wildlife in the area, making sure the proposed trail wouldn't disrupt the forest's existing ecosystem. "It's about balance of how can we continue to serve the community for the needs and wants that they have," he said. "Understanding this mixed-use natural trail surface is a big need, then we also have to balance out space and preservation and conservation." One hurdle CORA did not have to surmount with the Mount Airy Forest project: cost. At least for the first mile-and-a-half section, McClintock said volunteers will provide all the labor associated with building the trail. Since the city already owned the land, there was no acquisition cost, either. To the leaders behind the trail, its recreational and economic benefits seem obvious. First, having a natural-surface trail in an urban core park brings an amenity more common in suburban areas back to the city proper, McClintock said. "Having natural-surface trails in urban parks is so different because what you’re creating is an opportunity for people who live in densely populated areas to experience nature," McClintock told WCPO. "Whether they’re hiking or walking or running or whatever that is, you’re creating an opportunity for them to have the urban lifestyle as well as experience nature." Mayor John Cranley echoed this thought during his remarks: "Mount Airy Forest is an incredible gem for this city, this region and this country," he said. "But in my opinion it is under-utilized." Cranley said he sees the same potential with the forest in Mount Airy as he saw with Washington Park in Over-the-Rhine. "Washington Park was once a negative for Over-the-Rhine. Now it’s a catalyst for renovation and renaissance," Cranley said. "It is my fervent dream that, over the next three years, that Mount Airy Forest will become the catalyst for West Side renewal." When it comes to urban trails as creating such a catalyst, there's proof it works just a few minutes down Interstate 75 in Northern Kentucky. Devou Park -- perched atop Covington, Kentucky -- is home to more than 10 miles of natural-surface biking and running trails. In a study released in February , the nonprofit DevouGood Project found that trail users who biked exclusively or ran and biked the trails spent more than $2,200 each in the surrounding local economy during the study's 12-month period. In 2017 alone, the number of visits to the Devou Park trails toped 35,000. "We've proven this works in communities throughout the city, throughout the region," McClintock said. 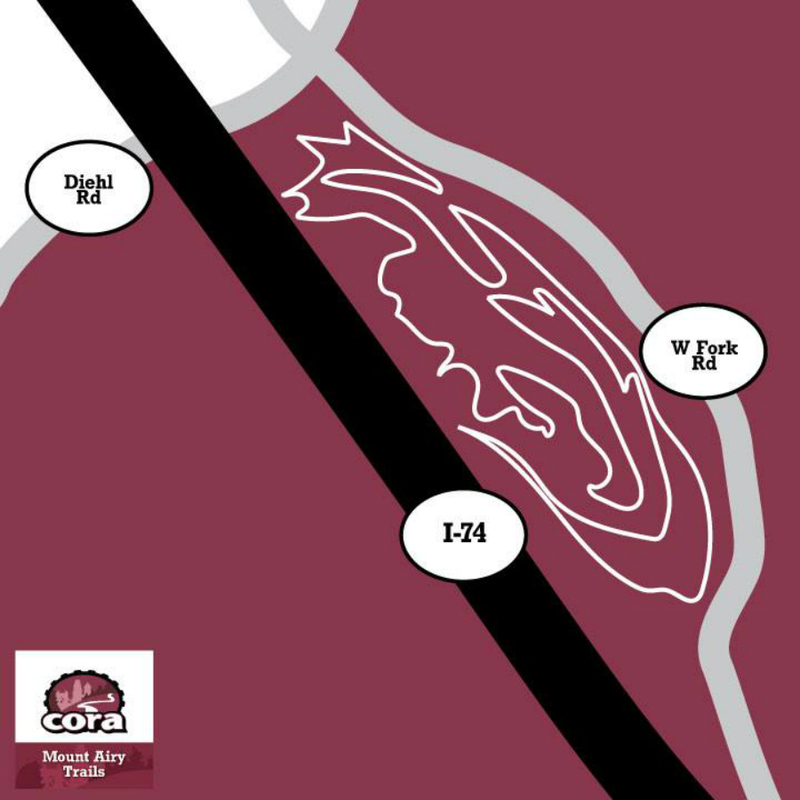 In addition to Mount Airy Forest and Devou Park, CORA supports trail systems in Caesar Creek, East Fork State Park in Clermont County; England Idlewild Park in Florence; Harbin Park in Fairfield; Hueston Woods in Oxford; Landon Deerfield in Maineville; Milford Trails; and Tower Park in Fort Thomas, among others. Ultimately for McClintock, the hurdles are a part of the process. "City red tape can be notoriously problematic. But that’s part of doing it. The stick-to-itiveness of the organizations said, 'We are going to get this done by hook or by crook,'" he said. "And with the mayor and the council behind it, folks finally started to understand what we were trying to do. "All those little steps finally got us to the point where we are here now." The first "trail day" for the Mount Airy Forest trail -- where volunteers can gather to help prepare for the trail's first phase of construction -- is scheduled for Sunday, July 8 at 9 a.m. More details here .